I am a new homeowner going through some remodeling projects and I would appreciate some advice for a concrete kitchen floor experiment. The floor is above grade and consists of 2 layers of plywood subfloor (3/4" total) resting on 2x10" joists spaced 16" oc spanning 12' with a poured concrete basement beneath. I have laid 3/4" hardwood as flooring in the spaces that border the kitchen floor and now I want to build a finished floor in the kitchen preferably at 3/4" total height to eliminate the need for overlap reducer trim along the border. I was originally planning on tiling this area but am now interested in trying a concrete floor instead. My current thought is to secure 1/4" hardiebacker board to the subfloor, prime with ARDEX P 51, and then layer on ARDEX SD-M or ARDEX FEATHER FINISH to a final depth of 1/2" followed by sealer. Anyone ever tried something like this before? Of course cracking along joint lines could be a big issue but if I really take my time with the subfloor prep and hardiebacker install do you think it could hold up? Sounds interesting. You probably would want to incorporate a floor decoupler like the Schluter system. I used henry floor patch (also feather finish) to level a wood floor that was warped just about 360 degrees and couldn't figure out how to shim the area with wood panels. Just a small area, however, about 3'x5'. True dimension 2x8, 1x t&g subfloor and t&g oak strip floor. Oak floor was screwed down. Also used 1/2" wonderboard and filling a volumn feather to about 1" deep. Used about 2 and half 20lb bags. These patching compounds are expensive but that was the least of it. Henry patch compounds (self levelers also from what I can see of the videos) could not be screed or troweled smooth for a large area, both because henry is quick drying and very sticky. 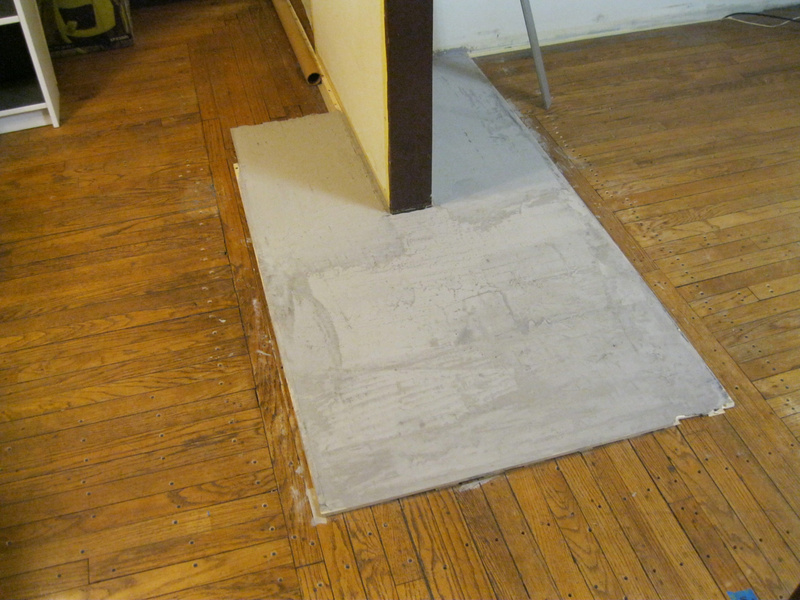 I installed leveled screed guides, used part of a aluminum straight edge and 20" steel trowel. Henry patch did screed and trowel to a level surface but there was no way it could be floated or troweled to a perfect surface. I also asked about this in another forum dedicated to tile flooring. The pros there said the same as well as affirmative NO to any cementious topping over a floor like mine. 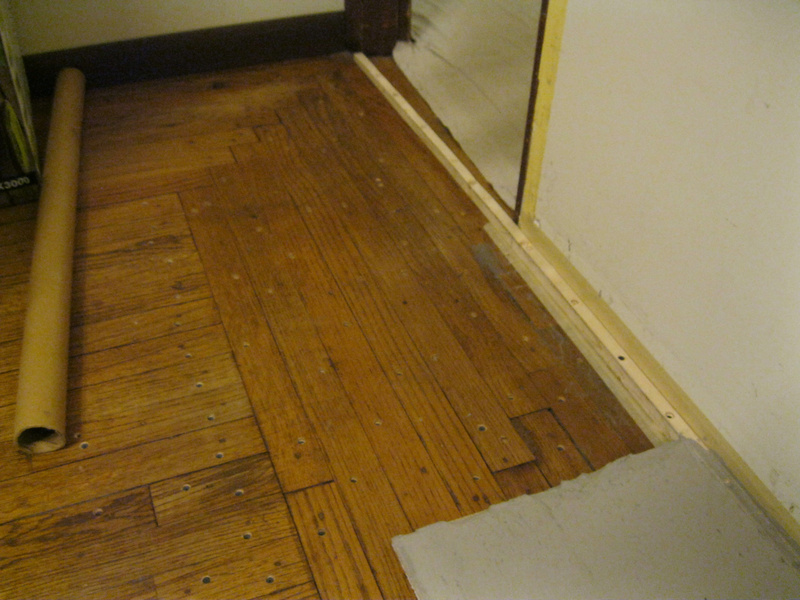 Your subfloor maybe inadequate. Single layer 3/4 ply is usually discouraged but yours is double layer of 3/8 ply? The fact that they come up to 3/4 is not same as single 3/4 ply. Usual cement floor is 3-4" concrete and not poured over the usual wood frame. Concrete may have some hours to float and finish but also whole lot of water and moisture to give away. Thanks for the feedback. The product I am interested in trying is marketed as a concrete "topper" (Ardex-sd-m) and used for resurfacing interior concrete floors to a finished look. From the photos and videos I can find online I think I would like the finished feather look with trowel lines just fine , and can be pigmented as desired. It goes on way more viscous than traditional concrete and like you experienced is quick drying so I would need to work quickly. The product is intended to go on in several layers so I could in theory just mix up enough that I can smooth at a time and sand between coats to avoid having to pour the entire area at once. I guess my remaining question is about the integrity of the design. Is ~1/2" of this topper on top of 1/4" hardiebacker going to be durable enough for a large surface area? I mean the tile I've installed before that has held up well with age was 3/8" anyways and from my experience with that, a sturdy flat underlayment was the most important aspect. But I'm not very familiar with concrete so I don't know if that is a fair comparison. The appeal of concrete to me is the lack of grout lines, the unique look, and the repair-ability. Having a 2 year old and one on the way there are plenty of drops and crashes in the kitchen but cracks and chips can be patched quickly with the same topper and then resealed. Wouldn't let me do this in the first post. I personally wouldn't want to use a concrete-like product over top of a wood subfloor. I would expect a ton of cracking. What's your reason for wanting concrete, instead of a more flex-friendly surface? That seems like a shared concern. Although it's a little different, I like the aesthetics of the concrete and think it would fit our layout better than most tile. I also like the idea of a smooth surface without grout lines. But I don't know all of the different choices out there. Is there any more flex-friendly materials you recommend I check out? I wish I had more experience with concrete. I do wonder if the Schluter system would allow enough decoupling to minimize cracks as Windows on Wash suggested. You will not like concrete after standing in it a while. Make sure that you put a floor drain and pitch toward that drain. Concrete is very porous, and stains easily. Especially in a kitchen. That is why I recommend a floor drain. You will be cleaning it more than normal. I also recommend a floor warming system in the concrete. It stays cool all the time. Go to any garage and stand there for about 20 minutes. Your feet and back will begin to hurt. That product Must be used over an existing stone or concrete surface. It cannot be set on wood. States that as point number 1 in the description. 2x what handyandy said. Video shows the compound skimmed over a tile floor in looks like a commercial building. Most likely tiles over a concrete slab floor. I was mostly reading about mapei products but ardex also. Search in the mapei website for more and better information. Probably similar products. I think the video shows resurfacing compound which is being used as a finished surface. Could be used as such, although what I read is that these surfacing compound can not be left as a finished surface. Maybe the finished surface is supposed to come from sealing. But again, search the ardex product description for where you can use this. Just anecdotally, I don't think you can skim coat this over a plywood floor. Wood floor can be constructed as stiff as possible but it still moves. Wood movement, even if minute, is still more than how much cementious compound can flex or stretch. Movement separator like schluter is not made to prevent things like this. It is made to protect the tile grout joints/thinset bond, not the tiles. Floor tiles are supposed to be structural enough by themselves so that people can stand/walk over them without cracking. If you like the look of concrete and don't want grout lines like tile, maybe some kind of concrete-look vinyl flooring, arranged to minimize the appearance of any seams?